Dry Cough occurs when an individual coughs without discharging phlegm or sputum. The most common cause of this is infection (like from a cold). Traumas, airway obstruction, allergic reactions — these also can be causes. Inflammation is likely a key negative factor. 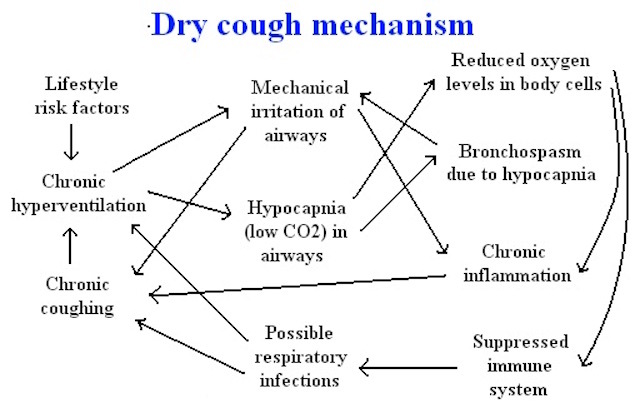 Dry cough is prevalent among those with respiratory problems. Often, the problem gets worse at night due to heavy breathing (causing a lack of CO2) in comparison to people’s breathing during the daytime. What is the most fundamental reason for someone to have dry cough? Why do those who have breathing problems tend to have it more? 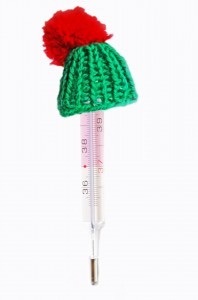 Consider the (low) CO2 values of ill people, due to chronic heavy respiration. This is illustrated in the table below. Even worse than indicated above, the breathing of individuals can reach 20 L/min or more during bouts of coughing. The more breathing is excited above the norm (shown at the top of the table), the lower one’s oxygen content is. A nasty cycle is pictured below. Since CO2 is important for smooth muscle relaxation, a CO2 deficiency leads to the spasm of all smooth muscles — the bronchi and bronchioles included. This causes bronchospasm. Earthing (grounding of the human body) is a natural and effective way to eliminate inflammation. Because those with dry cough likely have a positive body charge, inflammation develops and becomes chronic, leading to more coughing. Earthing, then, becomes a useful tool for quenching positive body charges and thereby addressing one of the true causes of coughing. Remedy 1. Keep your mouth closed all of the time. When you must cough, do so only through the nose. This will help you reduce the irritation of airways and will increase your brain and body oxygen levels by helping you not overbreathe. Remedy 2. Learning remedy #1 may take one to two days. When you have done so, begin pinching your nose closed when you must cough, while still keeping the mouth closed. This leads to no air exchange during coughing. The result is yet less bronchospasm (irritation of the airways) and less unnecessary breathing, leading to better oxygenation. Remedy 3. Reduced breathing. Sit down and get comfortable. Maybe in straight chair — someplace where you can have your thighs level or pointing downwards — not getting in the way of tummy movement. To stop your bout of coughing, relax and pinch your nose closed after your normal exhalation — no need to forcefully breathe out. As before, the mouth should be kept closed whenever possible. When you get a moderate or distinctive desire to breathe from doing this breath hold, make a small sniff (or take a smaller-than-normal breath through the nose). Then, relax all body muscles, the shoulders and chest most importantly. This relaxation should cause a soft exhale since your tummy (virtually the only muscle that should be used during breathing at rest) will recoil (or shrink) when it is not being flexed. All other muscles should be totally relaxed for this whole breathe-easy exercise. Continue this exercise — small in-breath, exhale only by relaxing — until your coughing stops. If you do the procedure right, you will breathe 30-50% less air than normal while being relaxed. You will likely get warm hands and feet (due to better circulation because of an increase in CO2) and a moist nose, all in one or two minutes. Image below. The blue shows your new (slower) breathing for this exercise, while the black shows your previous breathing pattern. Get more than 20 seconds for the body oxygen test (with the corresponding slower automatic breathing pattern) and persistent (or chronic) coughing will disappear.